If you have green tomatoes left over in your garden, here is a great tip on how to ripen them and turn them red. Pick the green tomatoes and place them inside a paper bag along with a ripe banana. Apparently the ripe banana gives off a gas that helps ripen the green tomatoes naturally. Here is a photo of a few tomatoes that I placed inside the bag that were very green. After just 5 days with the ripe banana they have ripened up nicely. Place green tomatoes for ripening inside a paper bag. 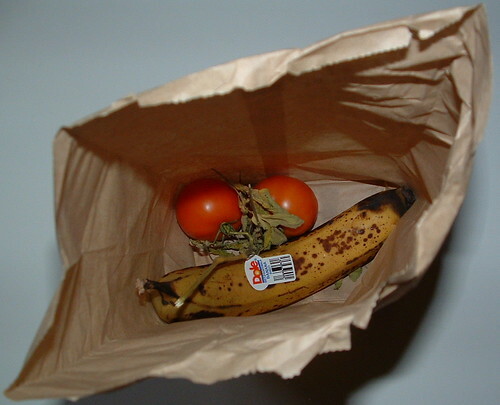 I used a small lunch sack and then added a ripe banana. Close the bag and check it in a few days. If the tomatoes aren’t ripe yet, close the bag and check it again in a few more days. Tomatoes should be fully ripened within 7 days.